The Monarch PCR & DNA Cleanup Kit protocol can be modified to enable the purification of ssDNA, oligonucleotides, and other small DNA fragments. The following modified protocol utilizes the same columns and bind/wash/elute workflow of the Monarch PCR & DNA Cleanup Kit with > 70% recovery and cleanup of oligonucleotides ≥ 15 bp (dsDNA) or ≥18 nt (ssDNA). The Oligonucleotide Cleanup protocol efficiently removes unincorporated nucleotides, short oligos, dyes, enzymes, and salts from labeling and other enzymatic reactions. Figure 1: Recovery of ssDNA and dsDNA oligonucleotides (1 µg) using the Oligonucleotide Cleanup Protocol and the Monarch PCR & DNA Cleanup Kit. 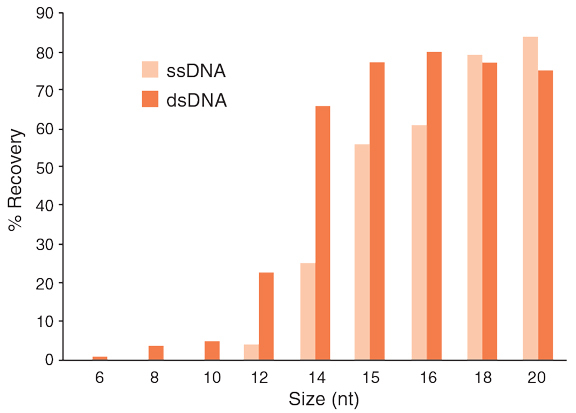 Synthesized ssDNA and dsDNA oligonucleotides (1 µg in 50 µl H2O) of varying lengths (6-20 nt) were purified using the Oligonucleotide Cleanup Protocol and the Monarch PCR & DNA Cleanup Kit (NEB #T1030) and were eluted in 50 µl water. The average percent recovery (n=3) of the oligonucleotides was calculated from the resulting A260 as measured using a Trinean DropSense™ 16. Use of the Oligonucleotide Cleanup Protocol and the Monarch PCR & DNA Cleanup Kit (NEB #T1030) results in the efficient removal of small oligonucleotides (6-12 nt) and > 70% recovery and cleanup of oligonucleotides ≥ 15 bp (dsDNA) or ≥ 18 nt (ssDNA). Input amount of DNA to be purified should not exceed the binding capacity of the column (5 μg). A starting sample volume of 50 μl is recommended. For smaller samples, nuclease-free water can be used to adjust the volume to the recommended volume range. Centrifugation should be carried out at 16,000 x g in a standard laboratory microcentrifuge at room temperature. A quick version of this protocol is also available. You can also download the Quick Protocol Card. Add ethanol to Monarch DNA Wash Buffer prior to use (4 volumes of ≥ 95% ethanol per volume of Monarch DNA Wash Buffer). Always keep all buffer bottles tightly closed when not in use. A starting sample volume of 50 μl is recommended. For smaller samples, nuclease-free water can be used to adjust the volume. Add 100 μl DNA Cleanup Binding Buffer to the 50 μl sample. Insert column into collection tube, load sample onto column and close the cap. Spin for 1 minute, then discard flow-through. If using a vacuum manifold* instead of centrifugation, insert the column into the manifold and switch the vacuum on. Allow the solution to pass through the column, then switch the vacuum source off. If using a vacuum manifold, add 500 μl of DNA Wash Buffer and switch the vacuum on. Allow the solution to pass through the column, then switch the vacuum source off. Repeat Step 5 (Optional). This step is recommended for removal of enzymes that may interfere with downstream applications (e.g., Proteinase K). Transfer column to a clean 1.5 ml microfuge tube. Use care to ensure that the tip of the column does not come into contact with the flow-through. If in doubt, re-spin for 1 minute to ensure traces of salt and ethanol are not carried over to the next step. If using a vacuum manifold: Since vacuum set-ups can vary, a 1 minute centrifugation is recommended prior to elution to ensure that no traces of salt or ethanol are carried over to the next step. Add ≥ 6 μl of DNA Elution Buffer to the center of the matrix. Wait for 1 minute, then spin for 1 minute to elute the DNA. Typical elution volumes are 6–20 μl. Nuclease-free water (pH 7–8.5) can also be used to elute the DNA. Yield may slightly increase if a larger volume of DNA Elution Buffer is used, but the DNA will be less concentrated. Care should be used to ensure the elution buffer is delivered onto the matrix and not the wall of the column to maximize elution efficiency. * Make sure to follow the manifold manufacturer's instructions to set-up the manifold and connect it properly to a vacuum source.